Set along a beautiful sandy beach less than one hour from Lisbon, in an area of protected rural landscape of rolling sand dunes and pine tree forests, Praia D'El Rey Golf & Beach Resort is an oasis of relaxed style and world-class comforts created to reflect the unspoiled natural beauty of its location. Literally translated as 'Beach of the King', you will be amazed by how close the beach is to the properties on the resort and by all of the fantastic facilities that are on offer! Praia D'El Rey is the perfect resort for couples, families and groups of friends! Praia d'el Rey golf course opened in June 1997 and it is certainly one of the most picturesque layouts in Europe, set in extensive grounds of pine forest and undulating dunes with spectacular views over the Atlantic and the Berlenga Islands beyond. Cabell B. Robinson has designed the course to be the complete golfing challenge with bold deep bunkers, undulating greens, and natural sand border areas contrasting sharply with the lush green fairways. With an academy, short game and driving range facilities available, you can fine tune your skills as well! Open all year round, tee times from 8am, close depending on the sunset. Golf shop 7:30am - 6:30pm during winter and 7:30am - 8:30pm during the summer period. Driving range open from 7:30am, close depending on the sunset. Tuition The Praia D’el Rey Golf Academy offers a wide range of short and long-game lesson packages available through PGA-qualified teaching professionals, including the latest V1 teaching software, with on course lessons also available, as well as junior golf schools. Dress code Soft-spikes required. Jeans, tennis shorts, swimming trunks and t-shirts are not allowed on the golf course and/or Driving Range Academy. Open all year round, 7 days a week, from 10am - 5pm, and 9am - 8pm during July & August. Praia d'el Rey boasts seven excellent all weather tennis courts, perfect for a family activity together or for a budding tennis player. The courts can be played on at any time of year, allowing you to enjoy a game whenever you like! Prices are approximately €7.70 per person, per hour for court rental. A tennis clinic to help improve your skills is also available from approximately €21 per person, per day. Health Club open all year round, 7 days a week, from 8am - 8pm. Indoor pool, Turkish bath and Jacuzzi open until 11pm. The Kalyan Spa Health Club features a state of the art gym, offering the latest fitness equipment. With a personal trainer on hand, you will easily be able to get into shape! There are also a wide range of fitness classes available, allowing you to keep up with your weekly keep fit routine! Approximately €8 per day, per person. There are plenty of other sporting activities to keep you occuppied on your holiday and why not visit the Adventure Club open on a seasonal basis, which is a professional and qualified team of supervisors who provide a safe and healthy environment combining education and fun for children, enabling parents the chance to enjoy a relaxing holiday! Activities and facilities include games, toys and computers for all ages and daily outdoor activities for children up to 16 years old. Plus there's regular culture and discovery tours to Óbidos, Peniche, and Berlengas and, with prior warning, birthday parties and a full activity programme during main school holidays. Club Aventura offers a wide range of half-day sportive, recreational and art related activities suitable for age groups of 3 - 5 years olds, such as decorative and dance workshops, face painting workshops, sculpture balloon, recreative games, beach games, Olympic team games and break dancing. For a range of sports activities the Summer Camp is also available for children aged 6 – 18 years old. Whilst the children are off having fun, so can the adults. Open during July and August, subject to demand. Open all year round, 7 days a week, from 10am - 7pm. The Kalyan Spa offers the latest in relaxing treatments, perfect to help you unwind and de-stress whilst on holiday. Choose from tempting massages, such as Thai or Shiatsu, to completely invigorate the mind and body. Facial treatments and body treatments including wine baths, aromatherapy and hydrotherapy are also available, perfect for unwinding and getting away from it all! De- Stress; Sports; Holistic Hot Stones, Mother-to-be; Absolut Spa Ritual, Total Time Out, Couples Rituals, Teens Treatments, just to name a few. Treatments start from approximately €10 and must be booked 2 days in advance to ensure of availability. Cancellations will be charged if not advised 12 hours before appointment. Praia D'el Rey is the ideal resort if you wish to spend lots of time soaking up the sunshine beside the pool during your stay. The beautiful beachfront and residence properties at Praia D'el Rey enjoy access to one of the fantastic communal pools on resort, with the villas enjoying their very own private pool. The hotel and spa boasts a popular indoor and outdoor pool, with access available at an extra charge per person payable locally. Enquire in resort if you wish to use these services. There are an choice of restaurants and bars on the resort, offering a range of cuisine from snacks to a la carte dining. 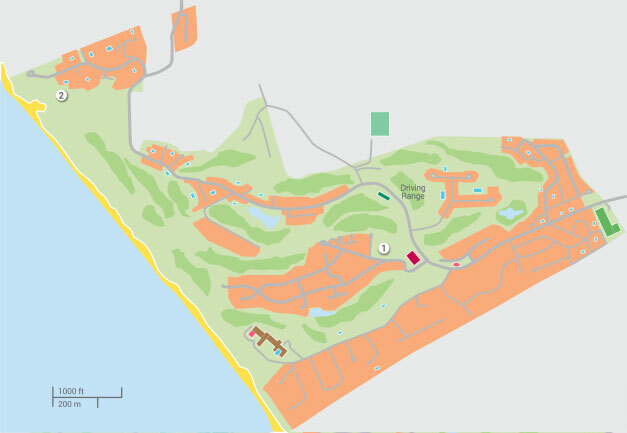 The Clubhouse has panoramic views over the golf course and the ocean and offers breakfast, lunch and dinner with an à la carte menu, as well as snacks and pizzas. The Clubhouse offers panoramic views overlooking the golf course and the Atlantic Ocean, serving, breakfast, lunch, dinner and drinks. Offering an a la carte menu ranging from healthy salads and filling sandwiches to tempting fish and meat dishes to pasta and pizza. With lunch dishes starting from around €6.50 and main meals ranging from around €12-€23. Try the locally-inspired delicacies and international dishes at the Tempera buffet restaurant, whilst enjoying magnificent Atlantic views. Open for breakfast and dinner. With a backdrop of the sea, Centato, the hotel's lobby bar is the ideal spot for a rendezvous or the perfect place to relax. You can simply enjoy a refreshing drink or warming coffee, or sample the snacks and tapas they have on offer. Situated overlooking the beach and across to the ocean, Mare Restaurant specialises in seafood, open for the majority of year the opening times of the restaurant vary on season however it is open for breakfast and dinner at all times. Romy offers a new dining experience in a relaxed atmosphere - it's the best way to spend an evening with friends or family in a sophisticated and welcoming environment. Open for dinner, serving a choice of delicious food, from salads, pastas and risottos, to fish and meat, prices range from approximately €17.50-€28.50. There is a second golf course, a short five minute drive away called WestCliffs, which offers a Steakhouse restaurant with à lá carte or light meals. This beautiful setting is ideal for golfers looking for quick meals or relaxed lunches overlooking the Ocean and the golf course. This bright, contemporary buffet style restaurant is a great place to enjoy a variety of dishes. Praia d'el Rey is located right on the coastline, offering miles of fantastic sandy beach, that is private to the resort. With a natural family feel to the resort, the beach is the ideal place for children to mix and play with others! Water sports can be booked locally at the resort reception or the adventure club in the beachfront area of the resort. Free WiFi internet is available at the clubhouse. A router can also be hired at the resort reception for a daily fee of approximately €15, subject to availability. If you have a late departure the resort offers a storage area at reception where you can leave you luggage. Excellent Villa (Apartment) right next to the sea with wonderful views and a sunset to die for. It would be useful to have some cleaning products and bin bags in the house if you expect it to be kept clean. Spacious and well equipped. Great location in the village and very close to the pool. Dehumidifiers were noisy and you had to empty daily (not advised of this and alarms kept going off). Lovely villa, close to the sea and well equipped. The villa is not at the location as indicated on the James Villa app, you need to follow the written instructions carefully. There is only one restaurant within walking distance, and this did not open on Sunday or Monday when we were there the last week in August. Lovely townhouse - clean, spacious and well equipped. Much nicer than we expected. What a treat! Lots of space , disappointed there were no fans despite the itinerary saying there were especially with us being there the hottest weekend of the year. Also a shame that whoever designed the villas put all four pools from our neighbouring villas backing on to each other albeit behind high hedges but the noise levels at times were not conducive to relaxing ! Overall though great villa which suited our family break well. Plenty of sunbeds , very safe area , loved the table tennis table. Shame there is no shop nearby , apart from the golf club house you need to drive everywhere. Villa wasn’t as described on website. The description was designed to mislead and was factually incorrect without a number of features highlighted.